Whether a branch is riddled with disease, obstructing healthy growth, or inspiring hate mail from your neighbor, don't pull out your gas pole saw and hurriedly start cutting. It's just as easy to remove a large branch correctly as it is to do it the wrong way. Improper removal of a branch can lead to rot, disease, or death of the entire tree. Follow a few simple steps to make sure that the rest of the tree remains healthy and that the cut fully scars over and heals. Also, make sure to use a pole saw for this task. Operating a chainsaw while standing on a ladder can be quite dangerous. Find the branch collar, which is the rough cuff that surrounds where the branch meets the trunk. 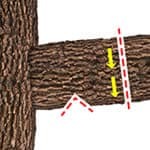 From there, measure a couple of feet down the length of the branch and cut a small notch with your pole saw on the underside of it (approximately 1/4 of the way through). 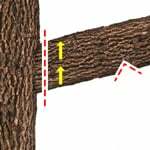 This cut, called the notch cut, will prevent the bark from peeling down into the trunk of the tree when you make your next cut. Because the final cut you make must be more precise, you don't want to be worried about the branch splitting and falling in the process. Get the majority of the branch out of the way first, and relieve most of the weight with a relief cut. Make sure the space below the branch is clear of any people, pets, or valuables. Then, just outside the notch you made, you'll cut completely through the branch and let it fall. Now that the majority of the weight is off the branch, you'll have less to worry about as you make your finishing cut. 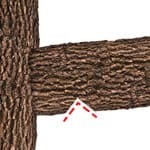 Do not cut into the branch collar, as the branch collar is responsible for closing off and healing the cut. Cut as close to the branch collar as possible without cutting into it. Depending on how the tree has grown, it may be a difficult angle to achieve with your pole saw. If necessary, cut from the bottom-up to make as clean of a cut as possible.